Available in per-server and per-report modes. Windward Studios Reviews Recently Reviewed! Comments: We're thrilled to have found this product! We recently finished a large PHP project and used Windward Reports (Autotag and Javelin Rest Services) as the reporting engine. Much of those reports employed some very large and complex scenarios. "Many" logical branches (If, Case, Loops). What the reporting package didn't have, we were able to create and add in the form of our own C# custom functions to fill the gap to handle everything from JSON Arrays to specialized functions to manage complex English linguistics. 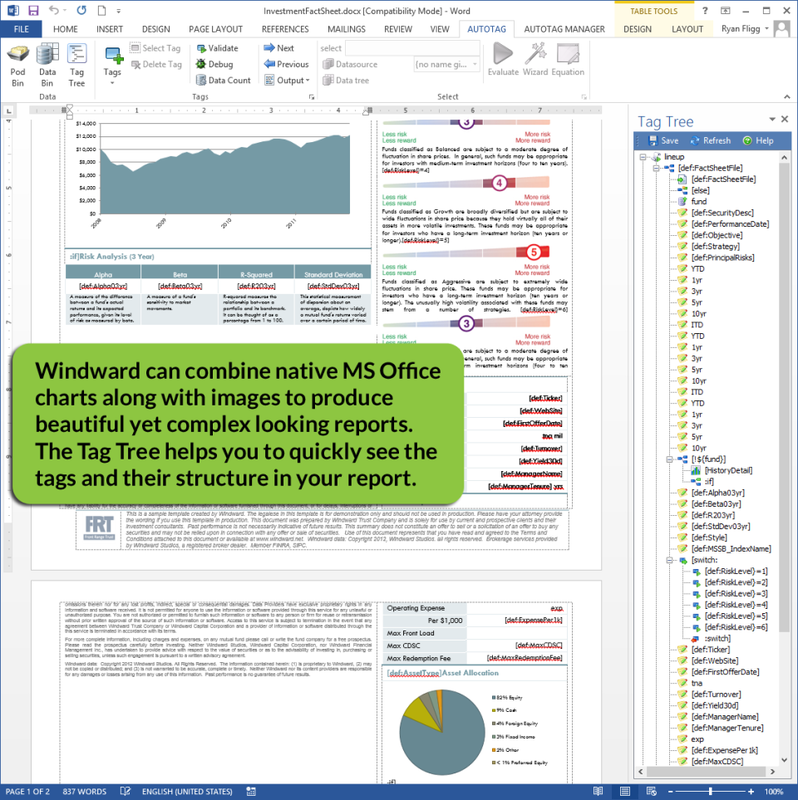 The ability to create a live report (WYSIWYG) right within Word, use styles and native MS Graphs lets Windward reports really shine through! You'll love it! Pros: Integration into Microsoft Word is great. Very easy connection to our corporate SQL Server databases, and report authoring is very intuitive. Our developers have no issues working with the engine component either. Cons: We've had no real issues with the software suite since we acquired it. Overall: NCC has been using Windward products as the reporting component of our land information system for over a decade now. It has always worked well for us, and we're planning to continue using it following a major system upgrade this coming year. Customer service and tech support has been great over the years, so we're pretty happy. Their developers have been responsive to requests from us regarding certain features, which is really nice. Pros: I love the fact that it sits in Microsoft products so easily. I feel this helps reduce a lot of the burden of learning a new piece of software as you are halfway there through your knowledge of programmes such as Word and Excel. Cons: Like most reporting software there are a few nuances that need to be understood to be able to work around them, but ultimately there are only a few of these and they generally aren't of a critical nature. Overall: I have been using Windward for nearly 2 years now and it has been the root cause of us being able to achieve what we set out to do. Needing to eradicate a number of repetitive Excel based reports, Autotag allowed us to build robust templates and improve our reporting ability and have greater control over our data. Recommendations to other buyers: Its a great piece of kit with amazing support. Integration into Microsoft programmes softens the learning curve required, along with the array of supporting videos and webinars. Once you are using it regularly then creating new templates becomes second nature. Pros: 1. 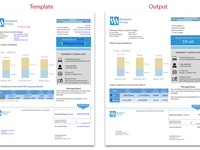 The ease and speed of the design of our document and report templates. Directly from our Office (Word, Excel, Powerpoint), we have our analysts designing the templates. Pros: Windward design studio has put the ability to develop new documents in the hands of operations, and frees engineering resources. Cons: Support was responsive but encountered a barcode issue that required multiple attempts to solve. It is a reality of software, but is the only con I could provide. Overall: The purchase of the software was straight forward. Software and licenses were easy to install. Windward software is as advertised. Support is great. Windward recommended a professional services vendor that delivered as well as the Windward product. 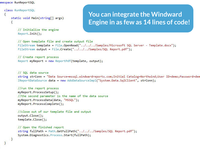 I strongly recommend Windward as a document generation solution. Pros: It got us out of the template design business. We set things up so the business users can design their own templates. We occasionally have to help when it comes to understanding the metadata, but 95% of the template creation and editing is now self-serve. Cons: Our previous reporting library was free and Windward we have to pay for. With that said, the amount we save in developer time is about 20x/year what Windward costs. Overall: It turned what had been a painful battle of both trying to schedule in time to create reports for users and to somehow figure out a way to actually create their desired report into a smooth, easy, fast process that quickly gives the business users what they want. Pros: This service is easy to use. 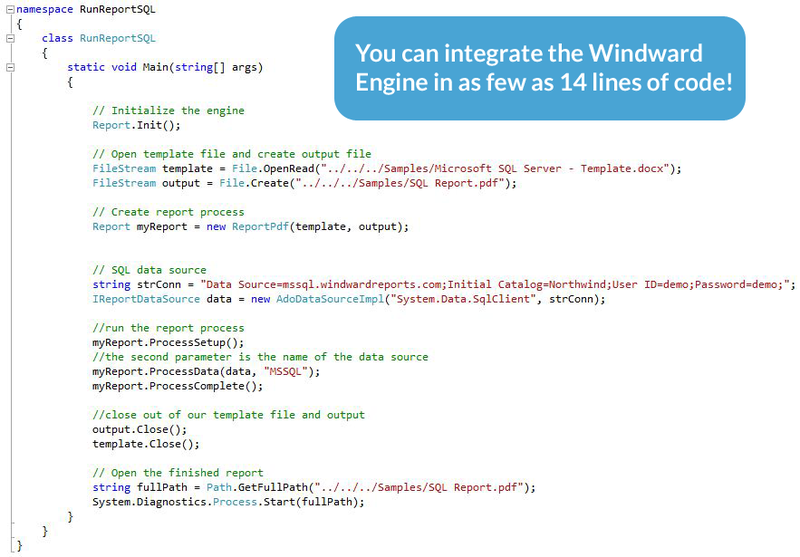 I have worked with windward for nearly 2 years now and each version gets better. They update nearly every 2 weeks and the integration with Word and Excel makes it easy to create reports with some advanced Microsoft Word features such as Charts. Cons: They documentation was not great although in recent months documentation has taken a full overhaul and is getting better each day. Overall: The experience has been excellent! Support is superb! Cons: You need to tweak the template a lot to get a pixel-perfect output for both Word and PDF. Overall: We use the Java engine to generate docs (PDF & Word) through a web application, and it's quick and straightforward to implement. Overall it's a great tool to create automated reports for web applications. Comments: I've worked with a number of different report tools. Nothing I've seen comes close to Windward. I'm only bummed I didn't find them 2 years ago. 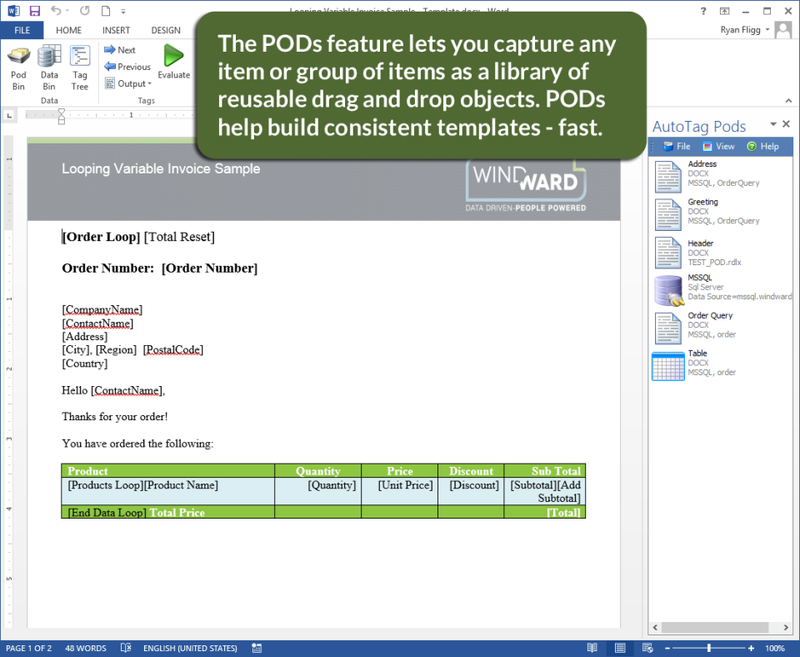 Pros: Windward offers the possibility to let skilled users create and maintain templates for their organization without the help of IT, unless new data input is needed. Cons: We had some issues with license pricing being far less attractive in an otherwise beneficial technical setup, without change in number of users. Overall: Windward studios is an interesting product if you want to flexible yet sound template making without the help of IT. The support team reacts very quickly although they can not always accommodate. Pros: The tag tree is very helpful for making quick modifications to the coding. The wizard is very handy in creating code for the tags. Cons: More complex coding is sometimes easier to modify manually, then view in the wizard. Overall: Superior service. Originally, the engine server failed to generate document output for our AutoTag templates. Windward analyzed and found that an exception was being thrown: "please see 'v16 RD exception received.txt'." They resolved the issue quickly with a patch and later added the fix to an updated formal version of the engine. The support team member helping me was very helpful and courteous. I have found the tag tree very helpful since it allows me to copy and paste code from other tags. I can then make some quick modifications to that code to suit the tag I am currently working on. Cons: 1. Need to use Word/Excel to build the report, no web based report builder for Java Engine. It can be a good thing, as most of our reports are in PDF, Word or Excel format. Overall: We need to create commercial quality operation reports. Windward is a perfect fit. It reduced our report development time a lot. The support is very good. Pros: I like that even a non-technical person can use the product. And that the licensing model is perpetual! Cons: Having the Report Designer integrated with MS Office is a PRO. However, it is also a CON because of MS Office's limited design capabilities. 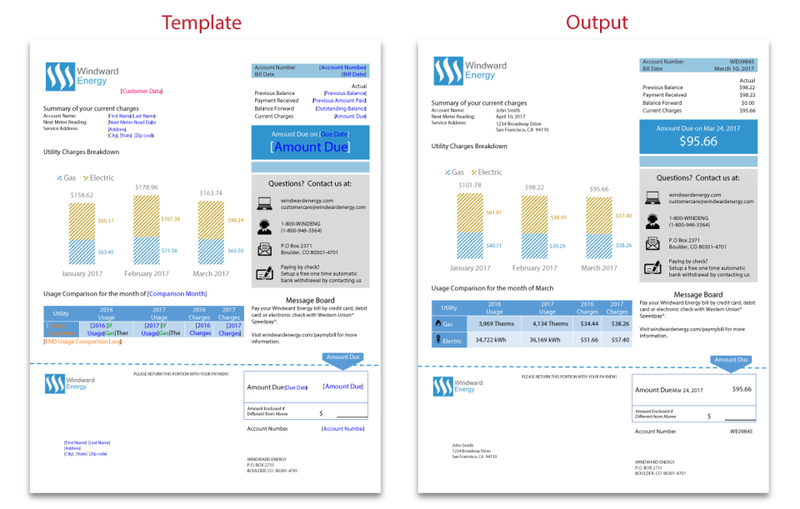 Overall: Implementing Windward to manage our invoicing and customer communications is a breath of fresh air! 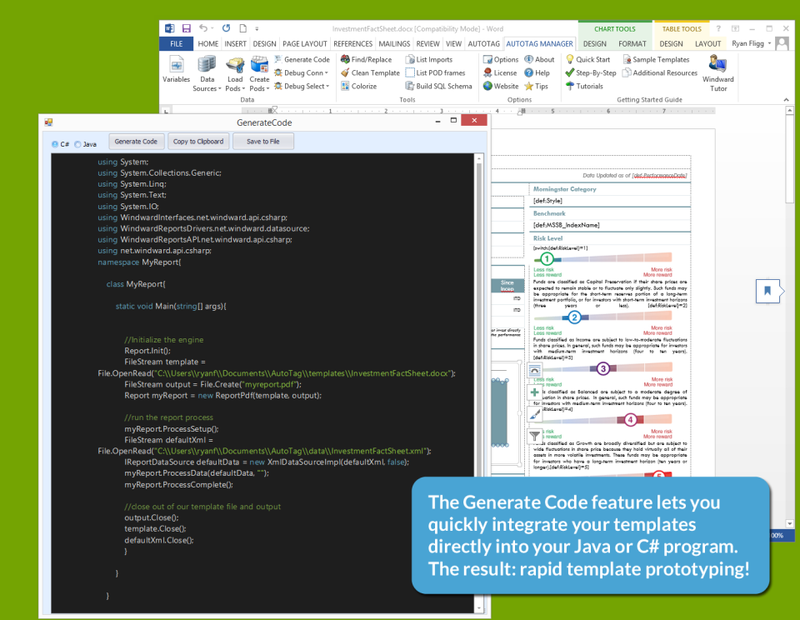 Unlike XSL templates, anybody can easily create and update templates using the Report Designer. It is a piece of cake - it didn't require me technical knowledge or even a formal training just applied simple logic and it was like something I've been doing for years! As a portfolio lead and business analyst, I've seen quite a lot of applications/tools that end up making the business adjust to satisfy how the application works. But not Windward, it is an application that adjusts to work for the business! Pros: The product is great. Much easier to grasp than other reporting tools as it embeds itself with Microsoft programs such as Excel and Word. The support network provided by the vendor is second to none. They have regular training videos and webinars to keep you updated and ensure your maximising the product as much as possible. Cons: The outputs can differ between formats. This can be a little frustrating but, it can be resolved easily with a little manipulation of the template. Recommendations to other buyers: Make sure you cover all aspects of the software from what it currently offers to how it works with MS and the support network it brings with it. Also try and engage with other users before committing, this is what I did and never looked back. Its a much more enjoyable tool than the likes of other well known products. 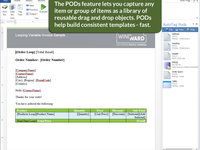 Pros: One of the most important features of using the Windward (Auto tag ) for us is its compatibility with Microsoft Office and generating dynamic "Table of Content". Cons: In some cases, it doesn't display the exact error message and it is difficult to troubleshooting in these cases. Totally, it has covered all of our needs. Pros: Integration was quick and painless, and the ease of building new templates with Autotag has really taken the pain out of rolling out new reports for customers. Cons: Nothing really, the costs can look high, but talk to Windward to see what other options there are. And it really is worth the money. Overall: We replaced a self built reporting system in our SaaS product with the Windward solution, when we were struggling to find another solution which could do the same. The engine integrated with our data sources in a snap, and AutoTag allowed us to replicate the reports quickly. We now have a hybrid system, which sometimes has to use our older reporting engine (for very specialised reports) but uses the Windward engine as much as possible. Recommendations to other buyers: There is a growing group of experts in the software, ask them for help. Pros: Powerful tooling, with easy to use wizards to help you select and preview your data. Hides the complexity of data selection and document generation. Pros: The easy of use and marking engine for templates. Cons: The missing libraries for processing of pictures from cameras. Cons: There aren't detailed error messages coming out of the RESTful engine. When a report isn't generated for any reason, the same generic error message is returned. Recommendations to other buyers: Attend the training. Learn the power of AutoTag. When you start using AutoTag, spend the time to learn how to use PODs, it will save you so much time the more documents you convert over to use AutoTag. Pros: It is the best reporting tool I have ever seen. One of the best tools they have is the document generation tool that allow to generate you report out of any data source you have and in any format you want. Cons: They need better marketing experience to show more what they really have, They have many features and tools they need to show more about it. Pros: Windward AutoTag is easy to use, especially the tag wizard to quickly tag content in your documents from various data sources, XML, SQL, etc... The vendor is great and always on their toes when it comes to replying back with open tickets or updated releases. Cons: Vendor, no issues. Product, some inconsistencies in PDF vs Word output, just need to do some extra formatting on the templates to get them to look similar when outputted. Recommendations to other buyers: Create the available POD files for your templates, it helps in automating your document generation process especially if you are creating a front end UI website for your users. Pros: Really great people behind the scenes who are willing to help and knowledgable about how to best utilize the software. Overall: Quick to use but powerful and customizable. Easy to integrate with a nice API. Comments: We are not a large client to Windward, but they always make us feel that way. Every time we have a question or suggestion, we get an impressively timely response. Even things that other vendors might charge us for, if Windward feels it would improve the product, they roll it into the next release. Their service greatly exceeds that of vendors we pay seven figures a year. Comments: Been using the Autotag software for nearly a year and a half now. Of which we use it extensively for fixed reporting. It isn't necessarily an easy to learn reporting system as it is pretty much bound by the restrictions in Microsoft Office. Furthermore there are a number of niggles which you need to learn to work-around to use it. However once you have done you will be using a reliable, fast and powerful piece of software for all your fixed reporting needs. Not to mention the great support which Windward offers! 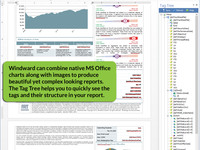 Comments: We've been using Windward Reports for well over 5 years now as the main reports tool within our Personality product. As the development piece (AutoTag) is a plug-in for Microsoft Office tools it makes formatting simpler if you know how to do so in Word/Excel already. We've created some incredibly complicated reports with this tool and our technical people find it easy to use but we don't find it as an end user reporting tool. Highly recommend it for companies looking for a new tool to create their company reports in. Comments: I'll start with the only con, it isn't cheap - but then cost is relative - we compared with other similarly scalable products and then, well, it looked much more favourable! If you need to generate multi-page PDF documents in fractions of a second based on simply tagged word documents and some data to fill in the blanks then these are the people to talk to. Windward Reports does much more - but even for this it is worth the cost. Support is great, the team is very friendly too. Pros: Before windward, we had to constantly say no to customization because of lack of man power / time in our development team. Now we can delegate this work to our service team. Cons: I wish they had a version of the server engine which could be installed on Ubuntu and work with NodeJS. On your desire for a version of the server that runs on Ubuntu, please suggest that at http://ideas.windward.net. If it gets enough votes, we'll implement it. Comments: PSiDEO has been successfully collaborating with Windward Solutions for many years as well as using Windward's products in its own solution with satisfaction for the same period. Additionally to performing products, Windward has also supported PSiDEO's activities by being open and flexible with its business models and negotiation schemes to ensure both companies business operations and needs are met in a collaborative and efficient way. Comments: We use Windward to in a business process that generates correspondence by merging data in various forms with Word templates. We have hundreds of templates and generate thousands of documents. It is all automated. It works great when you need to do this as part of a greater business process. I would highly recommend this product. Easy to use, learning curve minimal. Comments: In the set up we had a few questions on some very detailed modifications and the customer service was amazing!!!! It was very easy and turn around time on customer request was the best we have experienced. Comments: The AutoTag add-in our analytics team uses for reporting has significantly improved our analysis productivity and helped us to view metrics which aid management in making better data-driven decisions.